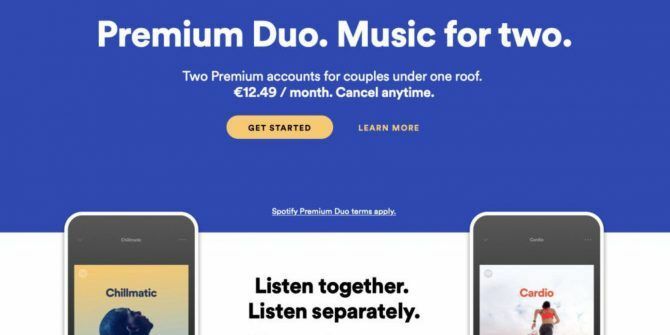 Spotify has launched a new subscription plan called Premium Duo. As the name suggests, Premium Duo is designed for two people who live at the same address. That obviously applies to couples, but friends who live together could also make use of Premium Duo. Spotify has a range of plans to suit all budgets and needs. There’s Spotify Free for those who listen at home and don’t mind the occasional ad. And then there’s a range of Premium offerings, including Premium for Family and Premium for Students Spotify Is Now Cheaper for Students in 36 Countries Spotify Is Now Cheaper for Students in 36 Countries Spotify has, since 2014, been offering Premium subscriptions at a discount to students in the U.S., the UK, and Germany. Now it's offering the same sweet deal to students in 33 more countries. Read More . Premium for Family allows up to six people to use Spotify Premium for a fraction of the price of individual subscriptions. However, Spotify insists that everyone needs to live at the same address. And Premium Duo offers the same deal for two people. What Is Spotify Premium Duo? Premium Duo gives all of the benefits of Spotify Premium, but at a discounted rate. So, two people can play any track at home or mobile, listen offline, and remove the ads for €12.49/month. An individual Spotify Premium subscription costs €9.99/month. Both Premium Duo subscribers get their own account, which means Spotify will recommend music to each person individually. However, Premium Duo subscribers will gain access to Duo Mix, a playlist which combines both individuals’ tastes in music. The reason the pricing is in euros rather than dollars is because Premium Duo is currently only available in a handful of countries. These being Colombia, Chile, Denmark, Ireland, and Poland. It isn’t yet clear whether Spotify will launch Premium Duo elsewhere. Spotify Premium Duo is an interesting proposition. It shows that Spotify is trying to cater to as wide a range of people as possible, including cohabiting couples. But it remains to be seen whether couples will opt for Premium Duo over sharing the same account. If you’re new to Spotify, you should probably check out our unofficial guide to Spotify Spotify Music Streaming: The Unofficial Guide Spotify Music Streaming: The Unofficial Guide Spotify is the biggest music streaming service around. If you're not sure how to use it, this guide will walk you through the service, as well as offer some crucial top tips. Read More . It will help Spotify beginners get to grips with the basics, including browsing and searching for music, creating playlists, and downloading music to listen to offline.